Creating award-winning technology which gives cinema audiences online access to the box-office and provides movie distributors with crucial marketing data, is not an obvious career choice for someone with a background in criminology and human rights. 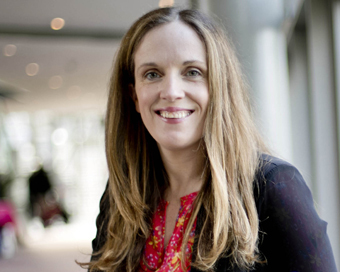 But it’s worked for Catherine Downes, a co-founder of dynamic Dublin tech company, Usheru, which recently scooped the 2018 Dublin City Enterprise Award. Usheru, which currently employs four people, confidently expects to have more than trebled its workforce by the end of the year and is now raising funds to drive plans to penetrate markets in Europe and the US. The company connects the film website usheru.com to the existing point of sale systems of cinemas, allowing consumers to book tickets very easily. It also connects film marketing to the box office and is creating a ‘direct-to-consumer future’ for film distributors. Not bad for a firm which launched on the market here in January 2015 and which enjoyed a London launch the following April. “We had funding from the British Film Institute to look at the connection between audience and the cinema, with the ultimate goal of filling capacity in cinemas,” recalls Dublin-born Downes, now the firm’s Operational and Marketing lead. The trio quickly came up with a solution – a website, usheru.com which provides details of films in local cinemas, and an accompanying app which allows cinema-goers to book seats online. “Our solution connected online advertising of a film produced by a company like Universal Pictures to the cinema box office. “The innovation in this is that we help them to maximise the effectiveness of their advertising,” she says, adding that the fledgling firm is currently working with a wide and rapidly increasing range of film distributors including Wild Card Distributors in Ireland, Dogwoof Pictures in London and the European arm of US mega company, Universal Pictures. Winning the award says Catherine, brought very satisfactory recognition for the team, and while the top prize of €5,000, was a very welcome support, the biggest bonus, she explains, was the validation the company received from the judges, comprised of senior business advisors and experienced mentors, along with the gratifying recognition for the hard work of the team. Usheru won the hotly-contested top award from a highly competitive shortlist of firms which included Fifty Three Six Media, a digital strategy agency for sport, Strata Project Solutions construction planning and scheduling services, Radii e-learning, mobile and social software creators and Clinishift app which connects clinical staff and hospitals in real-time. Usheru, which aims to grow its workforce to 13 by the end of this year, now goes forward to represent the Local Enterprise Office, Dublin City, at the National Enterprise Awards, which celebrates its 20th anniversary on May 24th. “We’re working towards allowing film distributors to connect directly with their audience and bring data to allow the distribute more effective decision-making.